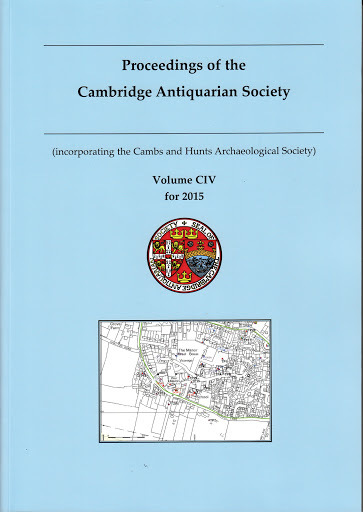 Actively contributing to archaeology in the Cambridgeshire area. Who made this clay pipe? Next meeting at Bar Hill will be on 24th April to finish processing the finds from Comberton. A lesser category of finds is worked stone. Quern stones are the most common type of worked stone found. This article goes into more detail about some of the various types. Common finds during our field walking are clay pipes. This article discusses how their maker can sometimes be determined and how to do it. Robert Skeen shares his interest in the hoards of the Bronze and Iron Ages. Our report on last year's fieldwalking in Childerley. Our report on further fieldwalking in Childerley. This is a report on the results of the first five years of fieldwalking in Childerley. The full main report of our HLF funded project at Wimpole is now available for download. Appendices giving detailed information are available on request. This report covers our work at Arrington in 2014 where we combined several archaeology techniques to confirm the Roman settlement reported in the 1989 PCAS Journal. Our series of articles have been put together to give you background information about some of the sort of things we find while field walking as well as techniques used in archaeology. We hope you find them useful and would welcome any feedback. The reports cover various aspets of our activiities, from finds while fieldwalking to investigations into the history of the sites or our excavations. We also includes reports by our Val Whittaker prize winners. This is the full report covering the group excavation on the Hardwick Church car park site carried out on behalf of the Hardwick Church PCC. Lawrence Billington has sent us his preliminary findings. There are some interesting observations about the differences in results from our original field walking. One interesting thing about the 2014 Test Pitting at Wimpole was the large number of coprolites found. This article discusses coprolites and their impact on Cambridgeshire. The Haslingfield Test Pit Project grey report is now available to download. Thanks go to Rob Atkins for his hard work in producing it. The report on our 2014 excavations at Wimpole on the glasshouse has now been submitted to the National Trust. Unexpected geological find while fieldwalking at Lower Valley Farm. What were they, meteorite, slag or something else? Despite the recent bad weather a number of significant finds have been made during our fieldwalking, including a pebble-hammer. This article is intended as a guide on how to distinguish man-made flint tools from the many natural broken and fractured flints. How clay tobacco pipes evolved in England from the time shortly after tobacco was introduced from North America. Please download a copy of the article here. Jezz Davies' (Val Whittaker) prize winning report from his studies of the foremast of the wreck Steam Trawler Sheraton lying off Hunstanton, Norfolk. An introduction into Geophyscs and how the various methods help us investigate archaeological forms beneath the soil. Please download a copy of our 'guide to geophysics' here. Among the finds while CAFG were fieldwalking in 1994 at Brook Farm, Haslingfield were some pieces of plates with the name Queens’ College on them. Who was the man who lived in the house at Wimpole where CAFG excavated in 2010/2011? A rather large collection of wine bottles used in the foundations of Mr Ratford's house, Wimpole. Some rather unusual thimbles found during the 2011 excavations. 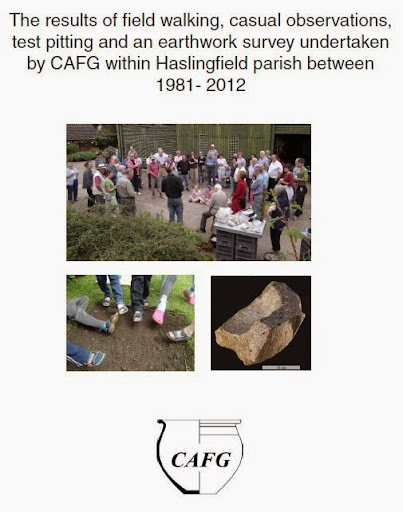 This report is a record of all the work carried out in and around Haslingfield by CAFG. We have fieldwalked about 25% of the parish between 1981 and 2007, conducted test pitting between 1985 and 2011 and carried out a 24 test pit study in 2012. This report summarises all the data recorded and offers some interpretation of the way in which Haslingfield developed from pre-historic times to the present day. Our thanks go to everyone who contributed to this report, especially Rob Atkins who wrote the draft over many weeks. The report is available on our Reports page and a copy has been lodged with the Cambridgeshire HER. It is intended to be placed on the Archaeological Data Service website and revised for inclusion in a future PCAS journal. A star find from Arrington, a 16th/17th century crotal bell. A discussion on the clay pipes found at Wimpole. Fieldwalking is not the only method of examining the landscape at large. Aerial photography has become an invaluable tool for examining both wide areas of landscape and small individual features within the larger area. Please download a copy of our 'guide to aerial surveying' here. Congratulations to all the members involved in this write up, especially to Rob Atkins who did a major part in getting it into print. Pages 71 - 87 in the journal cover all our work over the years at Haslingfield which has led to a re-interpretation of the history of the village and the changes that took place there over the Bronze Age to late medieval period. Let us hope that the Wimpole article being worked on at present also makes it into the next PCAS edition in 2016. A link to a summary of all the articles in this edition can be found here. Fieldwalking is a popular method of surveying landscapes for archaeological evidence of past, and recent, human activity. Artefacts are recovered by walking across the surface of ploughed fields, then analysed and recorded. Please download a copy of our 'What is fieldwalking?' guide here.